A few weeks ago we asked our Facebook followers what their biggest gardening challenge is. While there were a variety of answers (and we hope to address many of them here on the blog), one common one we’d like to start with is downy mildew. It may look like a fungus but downy mildew is actually a parasitic organism closely related to algae that can affect a variety of plants including basil, lettuce, spinach, melons, cucumbers, and squash. It causes pale green and yellow spots to form on the upper surface of the leaves. Spots of blueish or white fuzz may also form on the underside. As it progresses the leaves will turn brown and fall off. It rarely kills the entire plant but can cause a significant reduction in crop yields. Unfortunately, there aren’t many organic methods available to treat downy mildew. Some studies and anecdotal evidence suggest that copper or neem oil may help in some cases but they both seem to be far from reliable. Instead, we’ll discuss ways to prevent downy mildew in the first place. Downey mildew loves moist conditions so providing your plants with good airflow is an excellent way to prevent the disease. Getting vining plants up off the ground is a great way to accomplish this. Many cucurbits can be grown on a trellis. Another way to prevent downy mildew by controlling moisture is to water with care. This means watering in the morning so the plants can dry throughout the day and/or using drip irrigation or soaker hoses rather than overhead watering. If appropriate, prune your plants to increase air circulation. While it’s sometimes okay to space plants closely together if you struggle with downy mildew, give them room. Following spacing instructions is another way you can increase airflow around your plants and avoid moisture. It also helps ensure your plants have adequate nutrition and are less susceptible to disease. Downey mildew can spread from plant to plant so diseased individuals should be removed as soon as you notice them. While there are many different strains of downy mildew there are some downy mildew resistant varieties. 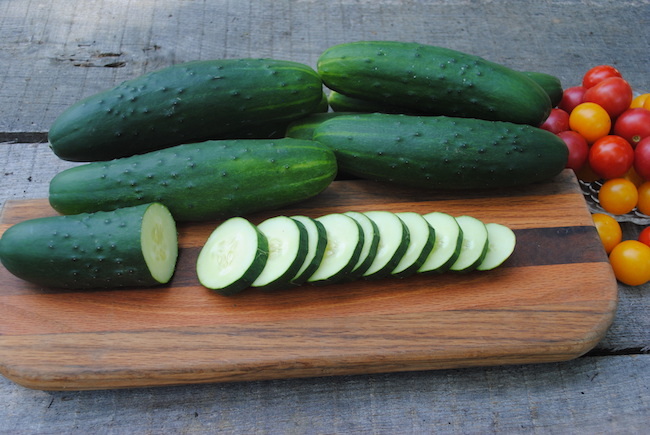 We carry DMR 401 cucumbers from Michael Mazourek’s breeding program at Cornell University that offer good resistance and excellent flavor. Due to the fact that downy mildew thrives in humid conditions, you may be able to avoid it by growing short-season varieties and avoiding the bulk of the wet weather in fall and spring. Short season watermelons like Blacktail Mountain and winter squash like Burpee’s Butterbush or Table Queen are great choices. Unfortunately, there is no organic cure-all for downy mildew. However, following these tips can help you keep it from wreaking havoc on your garden.